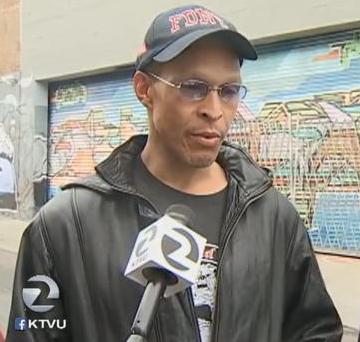 Two Alameda County sheriff’s deputies, who were caught on surveillance video beating a suspect, tried to cover up their crime by bribing a homeless man that had witnessed the beating in a San Francisco alley. Included in the bribe offered to the witnesses were a large gold medallion, cash, and cigarettes. All of those item actually belonged to their victim, Stanislav Petrov, which of course means they also stole from him in the process of committing the assault and subsequent bribery. According to his attorney, Petrov suffered broken bones in both hands and severe bruising to the head and body during the video-taped attack, which included repeated baton strikes by the deputies. Currently, Deputies Luis Santamaria and Paul Wieber are on paid vacation while their co-workers at the Alameda County Sheriff’s Department “investigate” them and have been since the incident took place last year. Not surprisingly, San Francisco District Attorney George Gascón has not yet decided whether he will charge the deputies (don’t hold your breath), in spite of the beating having been caught on video (embedded below) for the world to see. A San Francisco car chase suspect who was beaten by police is suing, and his lawyers say an officer tried to silence potential witnesses by bribing them with the man’s property. Stanislav Petrov led authorities on a 44-mile pursuit around the Bay Area in a mid-November that ultimately ended with a foot chase in a Mission District alley. Jerome Allen says he was bribed by deputies not to say anything about the beating. It was what happened in the moments after police finally caught up to Petrov and his stolen car during the incident that shocked observers. Surveillance footage released by the San Francisco Public Defender shows the 29-year-old run into a backstreet before two officers tackled him and began pummeling him with their nightsticks. “This was probably the worst law enforcement beating on video that we’ve seen since Rodney King,” attorney Michael Haddad told the Mercury News. The deputies involved, Luis Santamaria and Paul Wieber, said in their reports that they feared for their lives and Petrov had reached towards his waistband, though the suspect had left his gun in his car. But Petrov’s family is now suing the Alameda County Sheriff’s Office and Haddad is alleging that officers on the scene tried to cover up their brutality. He said that an officer took Petrov’s gold cross chain, as well as money, and gave them to a homeless man and woman who were camped nearby. “Don’t spend it all in one spot,” another officer reportedly said. Allen claimed he ended up selling the elaborate “Turkish gold” jewelry for $1,500. Incidentally, both cops “forgot” to turn their body cameras on before the beating. It was, however, recorded by one of the officers’ body cams because it got turned on accidentally while they were in the process of pounding on him with their night sticks. That, of course, means their is also a decent chance the bribery attempt was also caught on video, since he possibly wouldn’t have known that it was recorded.